San Francisco: Grabhorn-Hoyem Press, 1973. Octavo. (viii), (55)pp. One of 300 copies signed by the author and the translator, Lawrence Kart. This is the last publication of the Grabhorn-Hoyem Press. Montale's motets are presented in Italian with the English translations on the facing pages. A fine copy in yellow silk limp boards stab-bound with black thread. (Grabhorn-Hoyem 62). NY: Limited Editions Club, 2000. Hosoe, Eikoh. Quarto. 64, (2)pp. One of 300 copies. Signed by the artist, Eikoh Hosoe, and the calligrapher, Shunkei Yahagi. Illustrated with three photogravures by Hosoe. Tanizaki, one of Japan's most celebrated writers, sheds light on true human experience through sometimes shocking depictions of sexuality and family life. A Portrait of Shunkin explores these themes, while at the same time experimenting with alternative styles of narration. This edition is translated from the Japanese by Howard Hibbett. 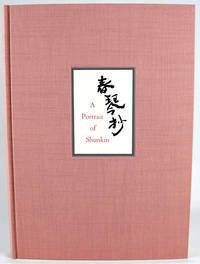 Bound in full pink silk with title label inset to upper cover. Housed in suede-lined box. Some bumps to box corners, else fine. Prospectus laid in. (Hammersmith: Doves Press, 1911. Small quarto. (232)pp. One of 200 copies, printed in red and black. This is the first of two Wordsworth titles published by T. J. Cobden-Sanderson, who "planned his anthologies very carefully" (Tidcombe, 70). In an announcement for this title, Cobden-Sanderson noted that the title for this selection was meant "to call attention to the fact that with the exception of some eight to ten all were composed within the decade 1798-1807." In original full limp vellum by the Doves Bindery. Some natural discoloration to vellum, light crease to spine. Overall, a fine copy. (Tidcombe DP25). Montgomeryshire: Gregynog Press, 1932. Hughes-Stanton, Blair. Tall octavo. 266, (2)pp. One of 275 copies. Illustrated with twenty-nine chapter headpieces from wood engravings by Blair Hughes-Stanton. Printed in Baskerville type on Japanese vellum. This copy has been bound in full light brown morocco by Sangorski & Sutcliffe. Upper cover features title in gilt, followed by five rules of decreasing length, and the Gregynog pressmark below. The title, author's last name, and pressmark appear in gilt on the spine. Several tiny spots of rubbing along outer joints, else fine. With the Eric Gill-designed bookplate of noted book collector and Cassell publishing heir, Desmond Flower, on the front paste-down, and another label affixed to the upper front paste-down. (Harrop 23). (Waltham Saint Lawrence): Golden Cockerel Press, 1928. Gibbings, Robert and Eric Gill. Quarto. 101pp. One of 500 copies. Illustrated with wood engravings and all but two initial capitals by Robert Gibbings. 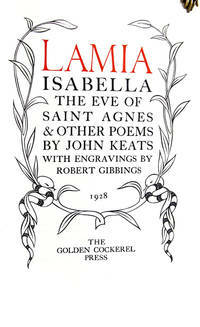 The remaining two capitals-"Lamia" on the title page and "IT" on page 18-were engraved by Eric Gill. A fine copy of what the Press calls "an almost perfectly proportioned book." In a variant binding of quarter black sharkskin (versus green sharkskin) and cloth boards by Sangorski & Sutcliffe. T.e.g. Lower corners slightly bumped, minor fading to spine, else fine. (Cave & Manson 62; Kirkus 36). NY: Vincent FitzGerald & Co, 1987. Welliver, Neil. Quarto. (17)ff. One of 75 copies, signed by the translator, Michael Feingold, and the artist, Neil Welliver, whose five color etchings and double-page fold-out lithograph were printed by Shigemitsu Tsukaguchi. The translator served as the lead drama critic for the Village Voice until it ceased operations, and he was twice a finalist for the Pulitzer Prize. In the publisher's binding of hand-woven fabric crafted by fiber artist Sara Dochow and bound by Zahara Partovi. Housed in a silk folding case by David Bourbeau. Lower corner of box slightly rubbed, else fine. (Darmstadt: Ernst Ludwig Presse, 1926. Quarto. 176, (8)pp. From an edition of 250, this is one of 100 copies printed for friends of the Press. A collection of songs by von der Vogelweide, a medieval poet and minstrel, whose songs are widely regarded as the pinnacle of the era's German love lyric. He is also responsible for using poetry to political ends, and was the first to do so in the German language. Bound in full vellum over boards, spine in six compartments with morocco lettering piece, gilt rules, and press initials and date at the foot. Board edges with diagonal gilt rules. Housed in a board slipcase. A fine copy of a handsome book. London: Florence Press, 1915. Two octavo volumes. xviii, 338; viii, 371pp. One of 250 copies. Keats' entire corpus, including an appendix for "Verses jocular or trivial" extracted from letters and notes. All are lovingly printed on hand-made paper, with sharp black ink and two-line initials to start each poem. With a preface by Sidney Colvin. Printed by the Florence Press for Chatto and Windus. Bound in full lapped vellum, with gilt titling to upper cover and spine. Green ribbons clipped but present on both volumes. Both show brush of toning to edge of text block, else very fine. A.e.g. Santa Barbara: Simplemente Maria Press, 2008. Heebner, Mary. Small oblong folio. 42 + 13 ff; 20 plates. One of twenty copies. With twenty pigment prints in triptych format by Mary Heebner. According to the artist, these prints began as collage paintings, created as an emotional response to the characters of Gertrude and Ophelia in Hamlet. Each triptych incorporates an image of the female form to the left, followed by images of covered text that has been partly scraped back to reveal linguistic fragments. The process of revealing and concealing dovetails with the nature of the play itself, in which, as Heebner notes, "fragments of vital information are lost, manipulated, or misinterpreted." Each illustration is contained within a bifolium with a corresponding passage from the play printed letterpress on kozo paper. The semi-opaque quality of the paper allows the reader to partially view the illustration beneath, and the arrangement of the text fits into the center panel of the triptych, adding further texture to the experience of engaging with the work. The suite is contained within a handmade paper chemise. An "actor's copy" of the full text of the play, which includes an index to the plates, is housed in a folder underneath. In a handsome red morocco-backed clamshell box with a skull and flower device inspired by the honeysuckle motif from the Second Folio debossed on upper cover. This device appears as the header on each of the excerpted passages. A visually appealing, challenging, and carefully conceived artist's book. Bussum, Holland: Halcyon Press, 1927. Octavo. 21pp. One of 125 copies. Beautifully printed with decorative initial letters in red or a brilliant light blue. Printed on Van Gelder handmade paper, this is the second book of the Press and is considered one of the most attractive. bound in full vellum with Halycon Press device in gilt on upper cover. Fine in black slipcase. With stamp of former owner, Dutch publisher and essayist Johan B. W. Polak, on inside rear cover, and bookplate of another owner inside front. (N.p., 1915. Signed by the author. Frost's poem typewritten on card backed with board. "The Pasture" first appeared in print in 1915, in Henry Holt and Co.'s North of Boston. Between the now-canon version and this, there are no differences aside from some minor additions of punctuation in the former: an added apostrophe to "shan't" and periods after "long" in each refrain. Tipped-in to archival mat. Fine. (Card measures 5 1/2 by 3 in. ; 143x74mm). Covelo, CA: Yolla Bolly Press, 1989. Octavo. xxviii, 92pp. One of 255 copies. Contains seven short stories and an introduction by the author, in which he discusses his stories and the process of writing. The stories are separated by sheets of colored paper covered with printing ornaments. 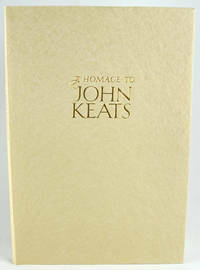 Attractively printed, and bound in forest green paper, with dust wrapper decorated with dual river design. Very fine. Verona: Officina Bodoni, 1982. Annigoni, Pietro. Quarto. 73pp. + 4 plates. One of 150 copies. Signed by the artist. Annigoni's four etchings, through the use of loose cross-hatching and lines, recreate the dark whimsy of Joyce's text. Bound in quarter green morocco with pale paper over boards. Spine somewhat toned, rubbing to paper at tail of upper board, minor bump to upper corner, else near fine. Housed in matching slipcase, generally soiled but structurally sound and very good. Verona: Officina Bodoni, 1946. Octavo. 21pp. One of 500 copies, signed by C. Day Lewis, who translated the work from the French. Dually printed in French and English by Hans Mardersteig for Martin Secker & Warburg of London. Rubbing to corners and expected soiling to edges of interior, else near fine in marbled wrappers. With original publisher's envelope, which bears the title and copy number. (Mardersteig 74). Coffeyville, KS: Zauberberg Press, 1990. Quarto. One of twenty copies. Designed, printed, and bound by Donald von Ruysdael Drenner at the Zauberberg Press. The typeface is Lutetia and the paper is Rives. Text is entirely in the original Latin, printed "for the love of Catullus." 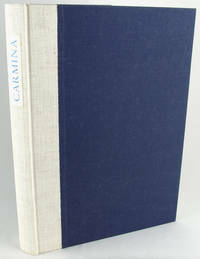 Bound in buckram-backed blue cloth, with a paper spine label. Some spotting to the binding and 1-inch closed tear to dedication page, else fine. (NY): Sarabande Press, 1984. Folio. 38pp. One of 250 copies, signed by the author. 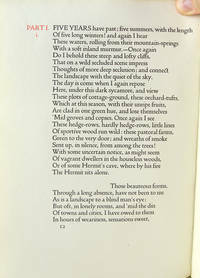 A group of eight meditative poems, each named for a theme or place which figured in Keats' poems. Dedicated to Helen Vendler. Beautifully printed, with titles in pale blue. Bound in paper over boards stamped in gilt on the front cover. A very pretty book in fine condition. Housed in a cloth slipcase.